The new Logitech Rally ConferenceCam is aimed for businesses with conferencing needs. 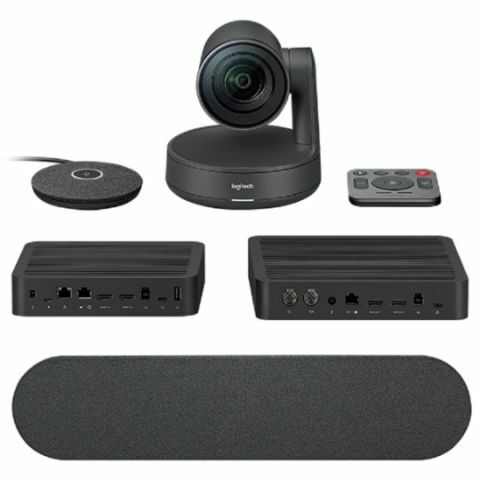 Logitech has announced its Rally ConferenceCam that supports video conferencing in 4k resolution, modular audio components and more. Today, Logitech announced Logitech Rally, a premium, modular ConferenceCam that delivers studio-quality video, exceptional audio clarity, and an automated video conferencing experience that can be tailored to your meeting space. Rally features Ultra-HD 4K video, modular audio components, expansive PTZ capabilities, and Logitech RightSense™ technologies that automatically frame people, optimize color and luminance for human faces, and improve vocal clarity for better meetings. The modular design makes it ideal for everyday conference rooms as well as boardrooms, classrooms and large meeting spaces. “Until now, customers paid a steep price for high quality video and audio system for conferencing solutions in large meeting rooms. Rally portfolio of products offer the customer a premium, modular system that raises the bar for USB-connected AV solutions - all at a fraction of the price of other high-end systems” said Srinivas Rao, Director – Video Collaboration Biz., Logitech, India & South West Asia. A modular approach makes Logitech Rally an ideal solution for meeting spaces of almost any size and shape. Rally Camera features 4K optics and intelligent PTZ features to capture every seat in the room. The standalone microphones provide a superior audio experience and more effectively suppress noise and echo. The front-of-room speakers offer richer sound than tabletop speakerphones. Thoughtful cable management enables custom deployments and integration by AV professionals. Premium materials, streamlined cabling, and sleek industrial design complement architectural spaces and high-end furnishings. Logitech Rally is compatible with almost any video conferencing service, such as Microsoft Teams, Microsoft Skype for Business, Zoom, BlueJeans, Google Hangouts Meet and more. Customers may purchase Logitech Rally through the Logitech Video Collaboration reseller network. The standalone Logitech Rally Camera is meant for rooms that have a pre-existing audio setup. Logitech Rally system, which includes Rally Camera, plus table and display hubs that minimize cross-room cabling, one speaker and one mic pod, will be available now. The system can be expanded with additional Mic Pods upto a maximum of 7, and 1 additional speaker bar. For more information, please visit Logitech.com or our blog.